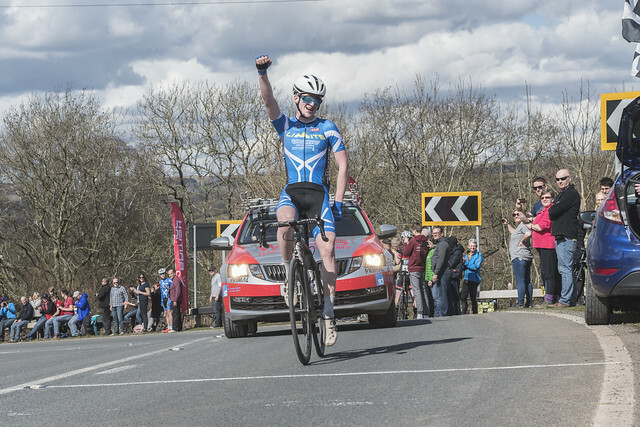 Dylan Hughes timed his solo effort to perfection to clinch the opening round of the British Cycling | Junior Men's Road Series - the Cadence Junior Road Race. Attacking from the day’s leading breakaway of five riders with 11 miles to go, Hughes, from North Berwick in Scotland, quickly built up a margin of over 30 seconds. Despite cramping on the finishing climb, he held on for victory. It was Hughes’ Spokes Racing Team teammate Ben Barlow who formed an original breakaway of two riders, who were joined by four chasers to tee up the winning move. They had a gap of nearly two minutes on the bunch but after Hughes made his winning push, the breakaway lost emphasis and a chasing group of four riders caught them at the bottom of the finishing climb to fight for the remaining places. Dylan Westley (Giant Halifax RT) surged from the chasers for second while Thomas Gloag (VC Londres) managed to get across to the breakaway on the final climb for third. “It’s my biggest win to date and first British National win, so it was good to get it out of the way,” said Hughes. “I rode across to my teammate and I was sitting on the chasers a little bit so we could work together once we got up there and were feeling fresher. “Obviously, two men in a group of six is better than one man in a group of two. The team did a good job stalling the bunch behind so I could get across. “When I attacked, I thought it was my only opportunity to get away and if I got caught, I’d have gone out the back, so I had to go. “Ben (Barlow) kept the break together and stopped anybody bridging up to me. A frantic opening saw four crashes in the opening six miles leading to the race being halted due to the conduct of the riders – additionally, seven others were disqualified during the race. William Orell-Turner (Wheelbase Cabtech Junior RT) took the opening hill before the brief stoppage and once the race restarted, a group of five riders tried their luck off the front. They were quickly brought back by the bunch in the rolling lanes around Mid Wales and with the bunch, together on the second time up the climb, Marco Passfield (Lee Valley Youth CC) stole a march. The fast descent from the climb allowed Ben Barlow (Spokes Racing Team) and Theo Modell (Wheelbase Cabtech Junior RT) to establish a lead. They worked well together and built up a lead of one and a half minutes over the bunch, with two chasers stuck in the gap. After around 12 miles out, the duo pursuing the breakaway were caught by the bunch and another four riders consisting of Matthew Lewis (Wolverhampton Whls), Dylan Westley (Giant Halifax RT), Louie Priddle (Mid Devon CC) went in search of the leaders, whose gap was around a minute. With two laps to go, Lewis was dispatched from the leading group, leaving a leading group of five riders, who had a gap of one minute 47 seconds on eight chasers, who were another minute ahead of the bunch, with Barlow leading. Then, with 11 miles to go, Hughes attacked on an undulating section of the circui,t quickly building up a commanding lead to take victory. Behind, the breakaway had lost in impetus and saw their gap over the chasers fall rapidly. By the finishing climb, it was down to a handful of seconds but Westley held on for second while Gloag finished third.